Flanagan arrived in NSW in 1827 with capital enough to qualify for a grant but Governor Darling refused to grant land to a man of Flanagan’s ‘class’. After journeying to Ulladulla by boat Flanagan travelled overland with Aboriginal guides, building a family home at the site of present-day Mullenderee (2 km north of Moruya). In 1840 Broulee became the site of the first court in the district and, the following year, was made the centre of a police district which covered the area from Jervis Bay to Eden. But Broulee’s importance was short-lived. A flood washed away the particularly dangerous sand bar at the mouth of the Moruya River in 1841. In 1848 land was opened up for sale. A town site was surveyed and Surveyor Mitchell, a supporter of Aboriginal place names, wanted it called ‘Mherroyah’; this supposedly being the Aboriginal word for ‘resting place of black swans’ which were very common in the district. Thus ‘Moruya’, or ‘Mherroyah’ was adopted when the town was gazetted in 1851. 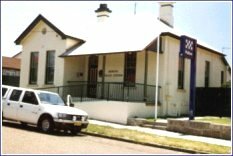 In 1859 the court was relocated, building and all, to Moruya, where it remained until the present courthouse was constructed in 1879. The Erin-go-Bragh Hotel was also shifted from Broulee Island to Campbell St, Moruya by Abraham Emmott who opened it as the ‘Beehive’ store. Emmott later set up his store elsewhere and used the old inn as his home, naming it ‘Merlyn’, until he could afford to build what was one of the first semi-detached houses in Moruya in 1875. ‘Merlyn’ was demolished in 1978 as part of the development of the new shire offices but the brick house survived and became the property of the Moruya Historical Society in 1975. Fine-grained grey granite was initially quarried in the 1860s for the Wesleyan Church and local harbour works. In 1868, John Young, the contractor for the Sydney GPO, leased land from the Louttit family on the south side of the river and opened a quarry, shipping stone to Sydney. Samples were sent to then Colonial Architect James Barnet, who used it for his work on the decorative columns of the facades at the Sydney GPO in the early 1870s. When Young’s lease expired the Louttit family took over the quarry which supplied material to Sydney for the statue of Captain Cook in the Sydney Botanical Gardens, St Mary’s Cathedral and the headquarters of the Bank of NSW. This quarry was taken over in 1924 by the contractors for the Sydney Harbour Bridge, Dorman Long & Co., who chose the material for the bridge’s pylons. Today it is a successful and relatively prosperous service centre although its position away from the coast has seen the coastal destinations develop more rapidly. The Moruya Police sector takes in Mossy Point, Moruya, down to Tuross and Potato Point and include Bodalla. Six police officers are stationed at Moruya and one at Bodalla station with one vehicle at each station.